It's Gloria from Girlia's Cards. Well, guess what? It's my turn again to share with you another card for Action Wobble. Oh Boy!!!! I love Mickey Mouse and it just brings back memories of the Mickey Mouse Club...add an action wobble and you have a card that bring instant giggles. 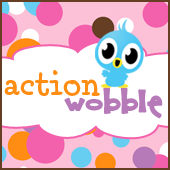 An Action Wobble on your card just brings any image to life and is just too much fun to watch and play with. Don't forget you can enter your cards in the Action Wobble Challenges taking place on Wednesday's or better known as Wobble Wednesdays.